I can’t wait for you to try these. You won’t believe how delicious they are and I’m betting they will become a staple around your house as they have mine. 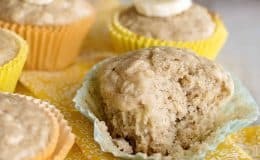 My husband and daughter have gone bananas… It all began when we got a new grocery store near us and Ricky and Katy decided to … Continue reading Low Sugar Banana Oat Muffins – Katy’s Favorite!